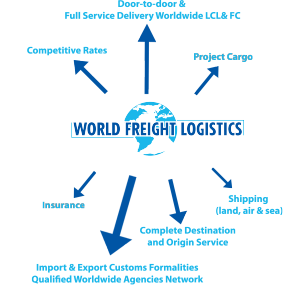 World Freight Logistics BV has been established in December 2000 and is part of WORLD FREIGHT GROUP. WFL may be a young company, but altogether its staff have over 100 years of experience in a wide variety of freight forwarding services. As well as communicating in Dutch, English and German, Persian and Arabic – WFL also has staff who speak French and Portuguese. The company’s goal is full-scale operation in every aspect of the forwarding business ! WFL aims to build quickly on its growing reputation in the market by taking full advantage of Rotterdam’s geographical position, its free port status with huge Rhine river barge capacity and full range of heavy maritime equipment, and its traditional role as Transshipment hub for North and West Africa, Portugal, Eastern Europe, the UK and Ireland. In addition to normal freight forwarding, one of the company’s divisions specializes in household removals to and from anywhere in the world. WFL is also active in the transportation networks linking the Benelux region with Central and Eastern Europe – especially the Czech Republic, Slovakia, Poland and Hungary – mainly handling FCL by rail and LCL/part-load by road transport. As the company’s name suggests, and given likely trends in the larger EU after 2004, WFL has focused on vigorously developing its position in the logistics provider market. WFL is now a confident player in the market, particularly in the Czech Republic and Slovakia, and we can be proud of what WFL has achieved in just three short years.